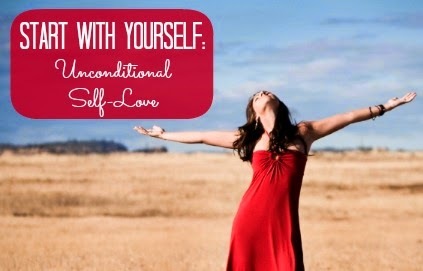 Learning Self-Love: Are You Ready For The Challenge? Self-love is perhaps the most difficult thing to achieve as a human being. It is somehow paradoxical that this abstract, love, that we all desperately want proves to be so elusive at once. It is certainly a paradox. During the last two weeks I have received numerous emails from readers who are very aware of the fact that they cannot love themselves or to find ways in which to revert this pattern. For the next few weeks, and for as long as it takes until there's a notion and a feeling in those interested in transforming their lives by loving the self, I am going to write about self-love and how to do it. The reason self-love cannot be treated in a single blog is because lack of love for ourselves is a learnt pattern that we have been subconsciously repeating since childhood. In order to change we have to look at the roots and some of our habits also will have to go. Changing habits is not an easy task. However unhealthy and damaging a habit might be to the self, we continue doing it because it is familiar, but; where does this familiarity comes from? Thoughts play an important part in this process. As soon as we decide to change a habit, even if this is a personal decision, we feel deprived of something we have been doing for a lifetime. As we avoid the feeling, this feeling turns into thought. When we lack love, whether this is self-love or the love of others, we live in a state of deprivation. Any changes that we might want to introduce in our lives may trigger a sense of scarcity and our response is to return to old habits for comfort. And we find comfort in what is familiar. Personal transformation and spirituality can in this case be compared to a yo-yo diet. Diets begin and end with ease. As we see no obvious difference from one day to the other, it is natural that negative feelings kick in and that we feel discouraged. The sensation is that we are back to square one and we have to begin all over again. We are not. Everything that we have done and experienced so far, even if it didn't bring the results we expected, add to our journey and transformation. Do not be discouraged. You are not beginning again. You took a break and this is fine. In the process of spiritual transformation we are going to experience an overwhelming amount of feelings and emotions that we learned to avoid since childhood. These emotions are uncomfortable and pausing to breathe is only natural. Don't give yourself a hard time. You already had enough of that. Lack of love as a norm begins in the family, with our parents. If you could see what their lives, especially their childhood was like, you would see and understand that they didn't have it easier than you have and probably they had it worse. When children are not loved adequately, we learn than love is not possible and find it difficult to give it and accept it. We are following the same patterns we learned as children. If you're reading this, you're probably not a child any longer, and you have the power to change it. Believe it or not, our parents do their best. They don't know better and whatever they did was their best. Their best does not mean good. If they did their worst, the reason was because they lived in fear. The common mistake I see in people is that throughout life we're looking for love in others, but love begins with the self. All the love we want and need is within. We just have to find it. We will never receive love from others until we learn to love ourselves. And if we did, we wouldn't accept it and run away from it. The best relationship we could ever have is with ourselves. For as long as we continue seeking, expecting or demanding love from others, we will never tap into self-love. It is not for others to love us. This is our responsibility. Love is a feeling. Only when we feel it we can attract it. It is of course possible to learn to love with someone else. But if we are not familiar with receiving love when it is presented to us it will make us feel uncomfortable. At that stage, we run from it. When we don't feel loved by others we react and do tend to blame them. Often we go as far as blaming the world. We know who we are and how much we have to offer to the world. We know how much love we hold within, so how is it possible that others don't see it? Well, we all know that deep within we are love, but we do not allow ourselves to feel it or to turn it to ourselves. It is also that the world is too occupied blaming each other for their lack of love. This is the reason why blaming and judging others does not and will never work. These are obvious signs of humanity's lack of love for ourselves and each other. Let's look within instead and let's find love there. Inside, not outside. I don't like to talk about myself and I don't need to either, but I believe that in this case my experience could bring some light and encouragement to others. My childhood was, to put it mildly, a very rough place to live in and love was not exactly a daily dish. I am not going to give details, as it involves other people, but one thing I can say with certainty is that no one would consciously choose to swap their childhood for mine. However hard you believe your childhood has been, you wouldn't like to experience mine or the childhood of anyone else. Childhood for me was hell, until it stopped being hell. By then childhood was already gone. I was already an adult by the age of six. I am not alone in this. There are so many others. What matters is not what happened then, but what happens now and here. It has been a long time that I forgave others and most importantly I forgave myself. As I took responsibility for my life, I realised that I was and am responsible for everything that happened to me. Everything means just that; everything. I cannot blame anyone for anything. What others do to me, they do to themselves. What I do to others, I also do to myself. To me is clear what I have to do. By taking responsibility I dag deeper into who and what I am and there was a moment in which that childhood from which I had been trying to escape for so long turned into an epic journey, full of colour, magic and incredible adventures. I saw the love I couldn't see then. Self-love and the love of those whom I believed never loved me. And perhaps the most important fact is this: I wouldn't change anything about it. I couldn't wish for a better childhood, as I now understand what every experience was trying to teach me and what I was refusing to learn. Looking back at the experiences that for years drove me mad and which triggered unbearable emotions, has no longer any effect in me. And as I realised and learned this, my story has changed and so the way I tell my story to the world. To begin a new journey within, I am going to suggest three things: responsibility, fun and humbleness. I also want to recommend an easy start and take small steps. After all what we want is to change habits and unlearn those patterns that no longer serve any of us. Write a list: Write a list of all the things you do that might indicate lack of self love. Keep the list handy, but don't do anything with it. This is only to make yourself aware of what you might be doing that could be interfering with your life. Don't be hard on yourself and don't expand on any point. All you want to do is to pinpoint a pattern, habit or behaviour. Keep it handy, but for now, put it away. Deep inside you already know. Once you put it away, ignore it, as what you wrote in this list is not really you. Don't worry if the list is incomplete and if at some point you think of something else to add. Don't. It's not important. You have now began a process to unlearn and forget. The sooner the better. Treat yourself: Yes, yes and yes. Treat yourself to anything you want. I repeat, anything you want. You are the leader of your life and you make your own rules. When was the last time you treated yourself to anything you enjoy? The only recommendation I'd like to make is that you don't poison yourself, but if this is what's required right now, do it anyway. Procrastinate: That's right. You read and understood well. Procrastinate, do nothing. Take time for yourself and indulge in just being. I know that when it comes to self-love even procrastinating is no easy task. There's nothing you have to do that's more important than you are right now. We are constantly bombarded by the idea that we have to be constantly productive . We don't have to. Be lazy and treat yourself to that time you want and need to just be. Think and remember this; it is in nothing that we find it all. Right now, you are the most important person in the world. Others can wait. If you have children, make sure they have everything they need or ask someone to take care of them for a while. You've been giving too much of yourself to the world. It's time you begin to give to yourself. And when you do, thank yourself for it. As you can see, the first steps are easy to follow when read. In practice they might not be. It is time now for you to pause and feel good about it. As from today, every Thursday I will publish a series on self-love. It is possible, very possible. And of course I am in. I do as I say. Let's see where this journey takes us and what difference makes in a few weeks from now. My new book is now available on Kindle. 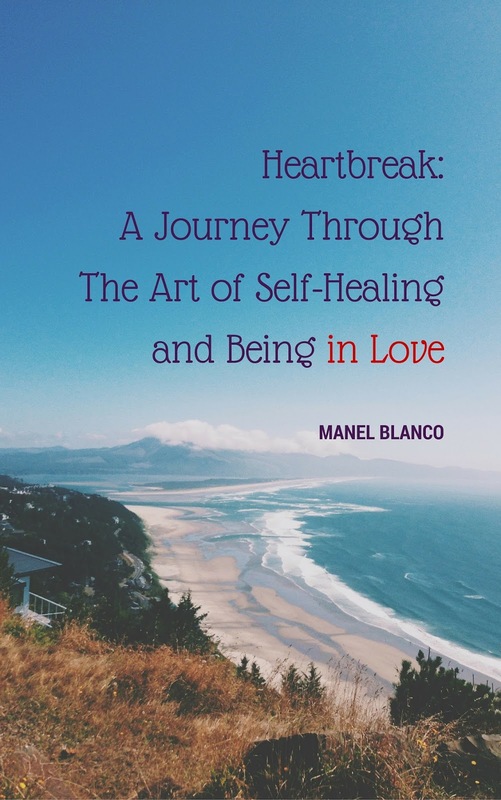 This book is a journey through the all the phases of heartbreak, exploring its unknown or unperceived origins, and how it affects a person throughout life, influencing thinking, behaviour, personal choices, relationships and in particular the hurt after separation. It offers a simple, practical healing method with practices easily adaptable to everyone's experience, taking the reader to the liberating moment of letting go. It is also an examination of the stage of being in love, and how by listening to the call of the soul, anyone could live in a permanent state of bliss.